At a time where the fashion industry is pushing more than ever before for inclusivity on all fronts, the mainstream’s embrace of modest fashion is, of course, a welcome one. Though Muslim women make up the majority of those who dress modestly, the concept is quickly emerging outside the limits of religious beliefs. Throughout the past several seasons, we've seen longer hemlines, flowing silhouettes, and an overall sense of conservatism come down the runways, proving that modest fashion is just as readily accessible to the mainstream market. It's designers like Ellery and Ganni, for instance, who are reaching a stylish (and diverse) audience. But what exactly is modest fashion? While there’s no single definition, it’s a way of dressing that is as much a part of one’s lifestyle and identity as it is an aesthetic choice. 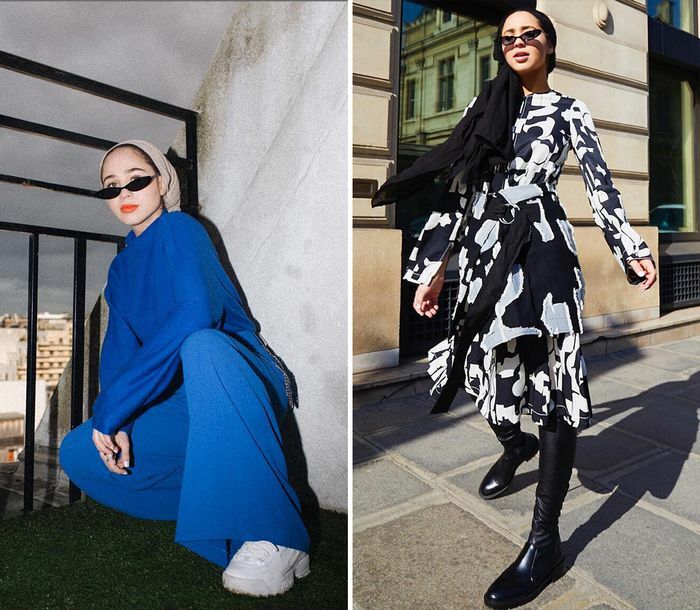 We spoke with Muslim fashion influencers to discover what modest fashion means to each of them. Naturally, for each woman, it meant something different, but at the heart of it was a desire to feel comfortable and confident what they wear. What does modest fashion mean to you? "Dressing modestly is a personal choice based on my cultural and religious background that makes me feel empowered despite the mainstream misconception of oppression (which is not the case for me) that comes with the hijab. Modest fashion means choosing to cover what I want to cover and show what I want to show without sacrificing style." Which brands are your favorite for modest fashion? "For fast fashion, I really love Mango, & Other Stories, H&M, and Zara. They never fail me. For more luxury brands, I think Tibi, Nanushka, Ellery, Bouguessa, Rejina Pyo, and Beaufille have really stood out for me recently." What makes you proud to be Muslim? "The word 'Islam' literally translates to 'peace,' and that's very much the core of it all despite misconceptions and the way the religion has been misrepresented in the media by certain groups. As a Muslim, there's usually a sense of sisterhood and brotherhood whenever I meet or cross paths with someone who also happens to be Muslim." Do you think modest fashion could be for anyone? "I think modest fashion, just like any genre of fashion, has a unique meaning to each person. Anyone can dress in a way that they choose to define as modest, so long as it brings them peace, comfort, and holds true to who they are." Which are your favorite brands when it comes to modest fashion? "My favorite brands are the ones that consciously provide affordable modest options. A few brands that have made a phenomenal effort to cater to a modest consumer base are Inayah, Poplook, Louella by Ibthaj Muhammad, Modanisa, and Touché." Do you always style your hijab the same way or do you switch it up? "I style my hijab each day based on three things: my mood, my outfit, and the weather. So, for example, on warmer days, I'll usually choose to style it up in a turban, while for formal occasions, I'll tend to wear it draped down and over my shoulder." "I don’t think I can really define modest fashion; it’s such a personal thing. To me, modesty means feeling comfortable and confident in the way that I dress." What are the staple pieces in your wardrobe? "A good pair of jeans and a black scarf. I’m currently obsessed with Levi’s wedgie fit jeans." "Absolutely. Modest fashion isn’t unique to Muslim women, and modesty can be perceived and interpreted in a myriad of ways." "Modest fashion is really like a type of style for me. There are non-Muslims who I sometimes see dress even more modestly than I do, whether it's in runways or on the street. So it really is for everyone." "My all-time favorite would definitely be Culture Hijab. That's where all my scarves come from. Its scarf choices are endless!" "I started wearing hijab about seven years ago when I was 15. I always say it's the best decision I ever made. I always wanted my hijab to become part of my style and always used to think of new ways to style it until I got lazy and now I just have my everyday turban." Though we aim to celebrate diverse perspectives on personal style, modest fashion is just fashion at the end of the day. Whether you're a practicing Muslim or not, you can choose to dress modestly and express yourself this way for so many different reasons. Curious to learn more about what modest fashion really means? Let this be your guidebook.